In this Policy, “Personal Information” means any information relating to an identified or identifiable natural person, whereby an identifiable natural person is one who can be identified, directly or indirectly, by particular reference to an identifier such as a name, an identification number, location data, an online identifier or to one or more factors specific to the physical, physiological, genetic, mental, economic, cultural or social identity of that natural person. The use of information collected through our SentinelOne Services is limited to the purpose of providing the service for which you have engaged with Us, as further described below, and in compliance with applicable laws and the terms of this Policy. When you visit the Site, We collect information, including Personal Information, only as necessary to interact with you, improve your user experience and provide you relevant data and services. We collect information, including Personal Information, under the direction of subscribers to any of the SentinelOne Services (“Subscriber(s)”), and have no direct relationship with individuals whose Personal Information We may process in connection with one of Our Subscribers’ subscription to and/or use of the SentinelOne Services. If you are an individual who interacts with the SentinelOne Services in connection with your relations with a Subscriber (such as an employee of one of our Subscribers) and would no longer like your Personal Information to be processed by Us in providing SentinelOne Services to a Subscriber, please contact the Subscriber that you interact with directly. SentinelOne Site. When you visit Our Site to learn about SentinelOne and its SentinelOne Services, or to portals connecting to the Site (such as Our Support Portal or Partner Portal), We gather information only as necessary to interact with you, provide you relevant data and services, contact you about Our SentinelOne Solutions, personalize or customize your experience (based on preferences or geography, for example), send you relevant marketing materials (subject to your opt-out option), for research purposes, and to generally improve the content and availability of the Site. Most of the information We collect is aggregated automatically, does not include Personal Information and includes Internet Protocol (IP) address, information about your browser and operating system, the state and country from which you access the Site, device ID, the type of computer and technical information about a user’s means of connection to the Site or related portals, the Internet service providers utilized, and Site features you access while browsing the Site. We may also send you notifications via email regarding SentinelOne Services to keep you informed of any SentinelOne Services updates, support or similar information. If you would like to review your communication preferences, or amend the manner and/or frequency at which you receive information or materials from Us, you can update your information or opt-out by following the instructions contained within email communication from Us. You can also contact us at [email protected] or write to Us at the address listed at the end of this Policy. From users who are required to login to gain access to a particular Site feature or portal, We may also collect usernames, passwords and other login credentials for the purpose of verifying user authorization to access the feature or offering. On our Site, you can sign up to receive additional information, attend a webinar, sign up to attend a live event or participate in any other offering. To receive additional information from Us, you must provide information such as your name, company name, email address, and phone number. This information is retained by Us and our third-party business partners to provide you with information, marketing materials, and updates regarding SentinelOne Services similar or related to information You have previously requested. Our third-party business partners provide SentinelOne with services that may require Us to provide them with your Personal Information. These third-party business partners are not permitted to use the information collected on our behalf except to help Us improve the Site and serve you in relation to your visit to Our Site and interest in the SentinelOne Services. SentinelOne requires all its third-party business partners with whom it shares Personal Information collected from the Site to take commercially reasonable steps and implement policies to safeguard your Personal Information. We do not sell, share or rent the Personal Information we collect from the Site to others. The Site may offer publicly accessible blogs, community forums, comments sections, discussion forums, or other interactive features (“Interactive Areas”). Any information that you post in an Interactive Area might be read, collected, and used by others who access it. To request removal of your Personal Information from an Interactive Area, contact us at [email protected]. In some cases, We may not be able to remove your Personal Information, in which case We will inform you of the underlying reasons. If you provide Us with feedback about SentinelOne, the Solutions, Software or Site, We consider this to be freely given and We may use your feedback without compensation or attribution to you. From time to time, We may post testimonials on the Site or associated portals that may contain Personal Information. We obtain your consent to post your name along with your testimonial. If you wish to update or delete your testimonial, you can contact us at [email protected]. SentinelOne Solutions. The SentinelOne Solutions offer a comprehensive Endpoint Protection Platform (EPP) comprising of multiple functionalities and features, including malware detection protection and remediation, comprehensive statistical analysis of Subscribers endpoints behavior, data presentation tools, security tools, endpoint controls and more. To provide Our Subscribers the most comprehensive malware detection, protection and remediation capabilities in the market, SentinelOne employs advance artificial intelligence technologies providing malware behavior analysis, enabled by comprehensive information gathering and analysis enabled by Our use of multiple data points of relevant information to reveal relationships and dependencies, and predict outcomes and behaviors so as to prevent, detect, contain, and mitigate malware attacks and identify those who initiate such malware attacks. Most of the information that SentinelOne collects through the Solutions is not Personal Information and relates to the computing processes and the devices guarded against malware infection by the SentinelOne Services. Such information includes device or network usage, endpoint login data, types and versions of operating systems and browsers, computer name, file execution information, and information about installed software applications. Some of the data We collect may be considered Personal Information depending on the laws of the jurisdiction where it is collected, such as IP addresses and endpoint browsing history. In some cases We collect Personal Information to the extent it is included within usernames, filenames, file paths, and machine names. We also offer Our Subscribers the ability to directly provide Us or to configure the Solutions to collect files, endpoint browsing history, and other content which may constitute and/or contain Personal Information, or when submitting crash reports, to make the product more reliable. At your direction, We may also collect or retrieve files as part of our Solutions. Files, file names, file paths and machine names, for example, may contain Personal Information if such Personal Information is included in such files. To the extent that We collect your Personal Information through our SentinelOne Solutions, We do so under the authority and direction of Our Subscribers, which often are corporate entities. SentinelOne has no direct relationship or contact with individuals whose personal information We may collect or receive from a corporate Subscriber and subsequently analyze and use. The use of information collected through Our Solutions is limited to the purpose of providing the Solutions for which Our Subscribers engage SentinelOne. We do not use any Personal Information collected through Our Solutions to contact or market products or services to these individuals. We also do not provide any Personal Information obtained through the Solutions to third-parties for the purpose of contacting individuals, or marketing products or services to these individuals. Instead, SentinelOne only uses the data it collects to provide the SentinelOne Solutions, as well as improve the SentinelOne Services, increase reliability and efficacy of the Solutions, and provide our Subscribers the best possible user experience, as more broadly described in Our more specific Solutions documentation. If you are a user of the Solutions, We will obtain the Personal Information you provide Us during the sales and/or fulfillment process. We may use such Personal information including name, phone number, mailing address, and email address to contact you and to provide you the Solutions, send you an invoice, perform accounting, auditing and collection activities, answer questions, provide support and update you about the solutions. Our Subscribers are solely responsible for establishing policies for and ensuring compliance with all applicable laws and regulations, as well as any and all privacy policies, agreements or other obligations relating to the collection of Personal Information in connection with the use of Our Solutions by individuals with whom such Subscribers interact. We collect information under the direction of our Subscribers, and have no direct relationship with individuals whose Personal Information We process in connection with the use of Our Solutions. If you are an individual associated with one of Our Subscribers whose Personal Information was collected by SentinelOne in providing the Solutions to a SentinelOne Subscriber, and no longer wishes to be contacted as Our Subscriber’s representative, please contact the relevant Subscriber with whom you work directly. In addition, an individual who seeks access, or would like to correct or delete Personal Information, should direct his/her query to the Subscriber acting as the data controller of such Personal Information. Upon receiving a request from Our Subscribers with respect to Personal Information, including requests to access, correct or delete the Personal Information, We will respond in accordance with the process detailed in this Policy. We will retain the Personal Information We process on behalf of our Subscribers for as long as needed to provide the Solutions to our Subscribers, to comply with our legal obligations, resolve disputes, and enforce our agreements. We may share your Personal Information with third-party business partners and service providers who assist Us in conducting business and providing you with SentinelOne Services. Transfers of Personal Information to such third-party business partners for these purposes are governed by Our Terms of Service with Subscribers subscribing to the SentinelOne Solutions and this Policy. SentinelOne contractually requires all its third-party business partners with whom it shares Personal Information to take commercially reasonable steps and implement policies to safeguard your Personal Information, and to not use your Personal Information for any purpose other than assist SentinelOne in serving its Subscribers. Please also note that in the course of interacting with you via the SentinelOne Services We may share information, including Personal Information, with any member of the SentinelOne Group. SentinelOne and its service providers use browser cookies, web beacons, tags and scripts or similar technologies to analyze trends, administer the Site, track users’ movements around the Site, and gather demographic information about our user base as a whole. You may manage how your mobile device and browser handles cookies by adjusting its privacy and security settings. We engage third party providers to serve marketing cookies that enable us to track and analyze usage, navigational and other statistical information from visitors to the Site and to display advertisements on other websites. This information does not include Personal Information though We may reassociate this information with Personal Information we have collected when it is received. Marketing cookies are also used to track the performance of our advertisements and are employed by third party advertising networks that We utilize. These advertising networks follow online activities of visitors to the Site and use this information to inform, optimize and serve tailored advertisements on the Site or on other websites they visit that We believe would most effectively promote the Service to you. We also use third parties to collect information that assists us in other methods of “remarketing” our Service to visitors to the Site, including customized email communications. One of Our third-party providers utilizes tracking cookies in serving ads. If you wish to opt out of receiving this type of marketing cookie, please click here. We also engage with Google Analytics as a third-party provider for analytics cookies. Analytics cookies collect information about how You use Our Site to help us improve Our Site usage and to better understand what may interest You on Our Site. The information generated by the analytics cookie (including the IP address) is transferred and stored on a Google server located in the United States. Google uses the information on Our behalf to evaluate how the Site is used, create reports about the activities on the website, and to perform additional services regarding website and internet utilization. Further information concerning the terms and conditions of use and data privacy can be found here or here. You can prevent the collection and processing of analytics cookies via Google by downloading and installing the browser-plugin available under this link. You can refuse the use of Google Analytics by clicking on this link. An opt-out cookie will be set on the device, which prevents the future collection of your data when visiting the Site. We and our third-party partners also use Local Storage (HTML5) to provide certain features on Our Site and related portal, to display advertising based on Your browsing activities and to store content and preferences. Various web browsers may offer their own management tools for removing HTML5. If you wish to not have this information used for the purpose of serving you interest-based ads, You may clear Your browsers’ HTML5 storage. If you are located in the European Union, click here to opt out of such HTML5 use. Please note this does not opt you out of being served ads, and you will continue to receive generic ads. As is true with most websites and services delivered over the Internet, SentinelOne gathers certain information automatically and stores it in log files. This information includes IP addresses as well as browser, internet service provider, referring/exit pages, operating system, date/time stamp, and click stream data. We may connect Personal Information to information gathered in our log files, as necessary to improve the Service for individual Subscribers. Otherwise, We generally use this information to analyze trends, administer and maintain the Solutions, or track usage of various features within the Service. The Site and other SentinelOne Services may include links and/or may allow you to link the Solutions to third-party sites, products or services. Please note that your access to and use of these third-party sites, products or services may result in the collection of or sharing of your information, including Personal Information. These third-parties have separate and independent privacy policies, and We are not responsible or liable for your interactions with such third-parties (as further described in Our Terms of Service). The option to link to such third-party sites, products or services from any SentinelOne Services is not an endorsement or representation regarding any third-party sites, products or services, and We encourage you to review and understand such third-parties privacy policies. Except as provided in this Policy, We do not lease, rent, or otherwise transfer your Personal Information to third parties. In certain situations, We may be required to disclose Personal Information in response to lawful requests by competent authorities, including to meet law enforcement requirements. We may disclose Personal Information in response to lawful subpoenas, court orders or similar legal process, or to establish or exercise our legal rights or defend against legal claims. We may also share such information if we believe it is necessary in order to investigate, prevent, or take action regarding illegal activities, suspected fraud, situations involving potential threat to the physical safety of any person, violations of our Terms of Service, or as otherwise required by law. In addition, We provide information regarding Our business to our auditors and legal counsel and, in some cases, that information may contain Personal Information, however such information may only be used for the purpose of providing Us their professional services. The security of Our Subscribers data, including your Personal Information, is not only important to Us, it is Our mission! We have adopted a range of administrative, physical and technical security measures based on leading information security standards, to ensure that Our practices in processing and storing Subscribers data protect against unauthorized access, alteration, disclosure or destruction of Subscriber data and your Personal Information. We follow rigorous security standards to ensure excellent protection of Subscribers data and the Personal Information collected and submitted to us, both during transmission and once we receive it. To ensure that we continuously follow and improve our information security practices, we have certified our practices under ISO27001, a leading information security standard, with a first tier third party audit firm. More information about our Information Security Program can be found here. Please contact Us at [email protected] with questions about the security of your Personal Information collected through Our Solutions or Site. 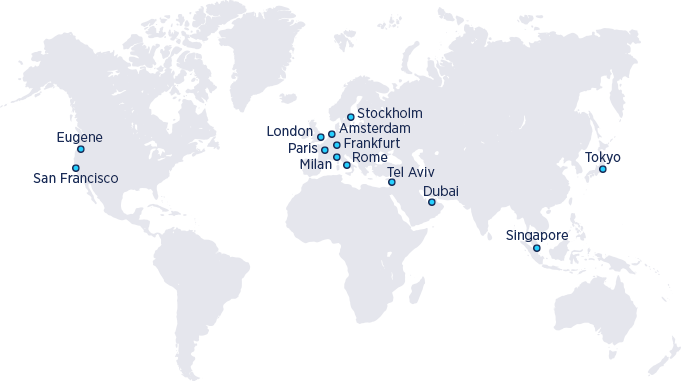 SentinelOne is a U.S.-based, global company. We store Personal Information about Site Visitors and Subscribers in various regions where Our Subscribers are located, primarily within the European Economic Area (the “EEA”) and the United States. To facilitate Our global operations, We may transfer and access such Personal Information from around the world, including from other countries in which the SentinelOne Group has operations for the purposes described in this Policy. We may also transfer your Personal Information to Our third party subprocessors, who may be located in a different country to you. SentinelOne complies with the principles of the EU-U.S. Privacy Shield Framework and the Swiss-U.S. Privacy Shield Framework (“Privacy Shield Frameworks”) as set forth by the U.S. Department of Commerce regarding the collection, use, and retention of Personal Information transferred from the European Union and Switzerland to the United States. SentinelOne has certified to the Department of Commerce that it adheres to the Privacy Shield Principles, and the Federal Trade Commission (FTC) has jurisdiction over SentinelOne’s compliance with the Privacy Shield Principles of notice, access, choice, onward transfer, security, data integrity, access and enforcement (“Principles”). If there is any conflict between the terms in this Policy and the Principles, the Principles shall govern. To learn more about the Privacy Shield Framework please visit https://www.privacyshield.gov/, and to view Our Privacy Shield certification, please visit https://www.privacyshield.gov/list. SentinelOne is responsible for the processing of Personal Information it receives under the Privacy Shield Framework and subsequently transfers to a third-party acting as an agent on its behalf. In certain situations, We may be required to disclose Personal Information in response to lawful requests by public authorities, including to meet national security or law enforcement requirements. In compliance with the Privacy Shield Principles, SentinelOne commits to resolve complaints about Our collection or use of your Personal Information. EU and Swiss individuals with inquiries or complaints regarding our Privacy Shield policy should first contact SentinelOne at: Sentinel Labs, Inc. (Attn: Legal Department) 605 Fairchild Drive, Mountain View, CA 94043, United States or by email to [email protected]. SentinelOne has further committed to refer unresolved Privacy Shield complaints to the Judicial Arbitration and Mediation Services, Inc. (JAMS), an alternative dispute resolution provider located in the United States. If you do not receive timely acknowledgment of your complaint from Us, or if We have not addressed your complaint to your satisfaction, please contact or visit https://www.jamsadr.com/eu-us-privacy-shield for more information or to file a complaint. The services of JAMS are provided at no cost to you. It is possible, that under certain conditions, it may be possible for you to invoke a binding arbitration for complaints regarding Privacy Shield compliance not resolved by the other Privacy Shield mechanisms detailed above. For additional information about your right to invoke binding arbitration, please visit: https://www.privacyshield.gov/article?id=How-to-Submit-a-Complaint. As a leading information security company, we are passionate about our Subscribers security and privacy. In accordance with the EEA’s General Data Protection Regulation (“GDPR”), SentinelOne has implemented various organizational and technological measures to ensure its compliance with all GDPR requirements relevant to its collection of EEA citizens’ Personal Data, including those relating to security, access, ratification, erasure, portability, onwards transfer to subprocessors, and export of Personal Information. Accordingly, SentinelOne has implemented extensive technical and organizational measures to secure the Personal Information it processes; only uses the services of subprocessors who guarantee their ability to implement the technical and organizational requirements of GDPR; has appropriate Data Protection Agreements (“DPA”) with each such subcontractors; timely responds to requests from data subjects to correct, amend, delete or not share Personal Information; is committed to providing breach notifications to relevant supervisory authorities and data subjects in accordance with GDPR timeframes; performs periodical risk assessments with regard to its processing activities of Personal Information; and has appointed a Data Protection Officer (DPO) to address all GDPR related inquiries. If You have any questions regarding SentinelOne’s GDPR practice, You can contact SentinelOne’s DPO at: Sentinel Labs, Inc. (Attn: Data Protection Officer) 605 Fairchild Drive, Mountain View, CA 94043, United States or by email to [email protected]. Upon request, We will provide you with information about whether We hold, or process on behalf of a third party, any of your Personal Information. To request this information please contact us at [email protected]. Subscribers of our Solutions may update or change their account information by editing their profile or organization record or by contacting [email protected] for more detailed instructions. To make a request to have Personal Information maintained by us returned to you or removed, please email Us at [email protected]. Requests to access, change, or remove your information will be handled within 30 days. If you are a SentinelOne Subscriber or otherwise provide Us with Personal Information in connection with your use of Our Site, We will delete this information upon your request, provided that, notwithstanding such request, such Personal Information may be retained for as long as you maintain an account for Our Solutions, or as needed to provide you the Solutions, comply with our legal obligations, resolve disputes and enforce our agreements. An individual who seeks access to, or who seeks to correct, amend, or delete inaccuracies in their Personal Information stored or processed by Us on behalf of a SentinelOne Subscriber, should direct his/her query to the Subscriber (who is the data controller as related to SentinelOne acting as the data processor of such Personal Information on behalf of such Subscriber and data controller). Upon receipt of a request from one of our Subscribers for Us to remove the data, We will respond to their request within 30 days. We will retain Personal Information that we store and process on behalf of our Subscribers for as long as needed to provide the Solutions to our Subscribers, subject to their requests for Personal Information removal. In some cases We may also retain and use Personal Information as necessary to comply with our legal obligations, resolve disputes, and enforce Our agreements. We do not knowingly collect any Personal Information from children under the age of 13, and the Solutions are directed to people who are at least 13 years old. If you are under the age of 13, please do not submit any Personal Information through Our Site or Solutions. We encourage parents and legal guardians to monitor their children’s Internet usage and to help enforce this Policy by instructing their children never to provide Personal Information through the Site or Solutions without their permission. If you have reason to believe that a child under the age of 13 has provided personal information to us through the Site or Solutions, please contact Us at [email protected]. We will use commercially reasonable efforts to delete such Personal Information. This Policy applies only to information collected through Our Site or by the use of our Solutions, and not to information collected offline. Your download and use of our Software may be subject to additional terms and conditions that define your rights, as well as Our rights, with respect to the Software and its use. Such additional terms and conditions are contained in Our Terms of Service, Our Software Evaluation License Agreement or other agreements that you may be required to accept prior to using certain SentinelOne Services. If you are a California resident, California Civil Code Section 1798.83 permits you to request and obtain from Us, once per year, information regarding the disclosure of your Personal Information by SentinelOne to third parties for such third parties’ direct marketing purposes. With respect to these entities, this Policy applies only to their activities within the State of California. If you are a California resident and would like to request this information, please send an email to [email protected] or write to Us at the address below. If there are any material changes to this Policy, you will be notified by our posting of a prominent notice on the Site prior to the change becoming effective. We encourage you to periodically review this page for the latest information on our privacy practices. Your continued use of the Site and other SentinelOne Services constitutes your agreement to be bound by such changes to this Policy. If you do not accept the terms of this Policy, your only remedy is to discontinue use of the Site or Solutions.